I wanted the last beer festival of my 20s to be a good one, and the Big Beers Fest in Breckenridge, CO did not disappoint! 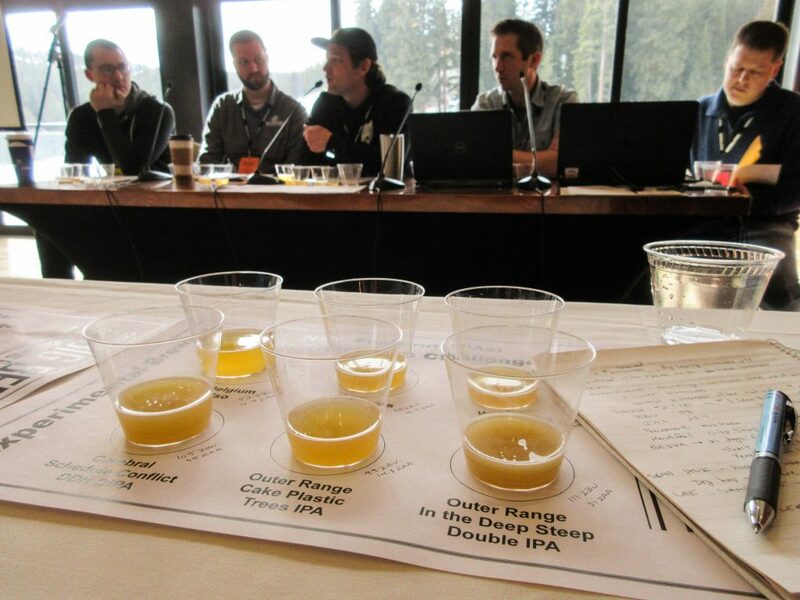 My last post, The 2018 Big Beers, Belgians & Barleywines Festival Experience, detailed my foray into the high altitude fest weekend, but this one will dig into the tasty tidbits of knowledge I absorbed from its seminars. This is my Seminar Experience: 2018 Big Beers Festival Edition. Herz and Dulye teamed up to guide guests through a beer and food pairing journey. Each guest was given four beers and three food items, and were encouraged to explore the possible flavor combinations. The presentation was tight, interactive, and fun! The general order in which to taste beer with food: beer first, then food, then beer again. “Oleogustus” is the Latin term for fat, and is officially the sixth taste (next to sweet, salty, bitter, sour, and umami). The beer experience is more than what’s in the glass. It’s about the environment, the people you’re with, and the food you’re enjoying along with your beer. Do not taste beer in order of ABV, but in order of flavor intensity! Lost Abbey Angel’s Share with mushroom soup is absolutely divine. I got a free physical copy of the CraftBeer.com Beer & Food Course for sharing my thoughts about Angel’s Share paired with mushroom soup. Rad! Thanks Julia Herz! Neil Fisher, Head Brewer/Owner, WeldWerks Brewing Co.
Ross Koenigs, Research Brewer/Recipe Designer, New Belgium Brewing Co.
Lee Cleghorn, Co-Founder, Outer Range Brewing Co.
Sean Buchan, Owner/Head Brewer, Cerebral Brewing Co.
All panelists were extremely knowledgeable and serious about upholding a high standard of brewing and understanding of the behavior of hops in beer. The level of nerdity that sprang from their mouths was a bit much for me to chew, and I’m honestly still processing. IAA (isomerized alpha acids) are 9 times more bitter than AA (alpha acids). Alpha acids (from hops) become isomerized during the boil, increasing their bitterness. IBU Myth Busted: 1 ppm of IAA does NOT equal 1 IBU (international bitterness unit). The calculation is much more involved than that. When a beer is dry hopped, the enzymes in the hops will aid in further fermentation of the beer. Dry hopping increases the pH of a beer, which can increase the perceived bitterness. Therefore, dry hopping can make a beer seem more bitter than it was pre-dry hopping. Humulinones are a natural hop bitter acid formed by the oxidation of alpha acids. Low IBU beers dry hopped with hops containing a high concentration of humulinones can be perceived as having an increase in perceived bitterness. Alternatively, high IBU beers that are dry hopped can exhibit a decrease in IBUs, as the humulinones can knock IAA out of solution. Using hops with a high humulinone content for dry hopping can help counteract this loss of perceived bitterness, though the IBU level will still be reduced. Or, take advantage of this observed tendency, and use it to lower the perceived bitterness while increasing the hop flavor and aroma (as in New England IPAs). In New England IPAs (NEIPA), yeast should not be a contributor to haziness. A high concentration of suspended yeast will aid in clarity once the beer is packaged, which is not the goal of the style. To increase the shelf life, condition the beer for an extended period of time before packaging. Haze should come from the use of protein rich grains like oats, spelt, and wheat. Flour will settle out of a beer, and is not a good contributor to sustained haze. The term “double dry hopped” is a marketing scheme, but it typically means the beer is dry hopped with double the normal weight of hops. John Giarratano, Inland Island Yeast Co. 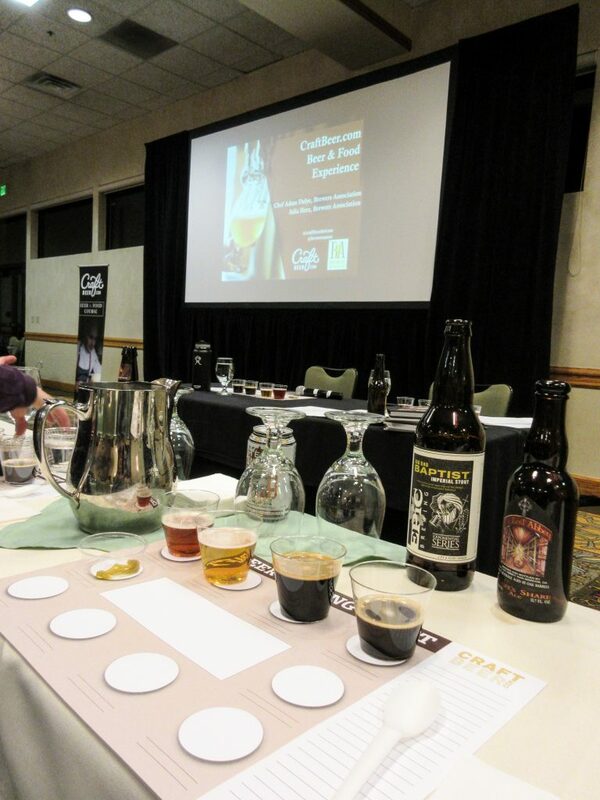 This seminar was based on the concept of allowing fermentation character to be the prominent expression in beer. The beers featured were collaborations between Brewed Food, Inland Island Yeast Lab, and several outstanding breweries. The experience was one of sensory exploration and appreciation of nuanced fermentation character. Mango and pineapple have a similar chemical composition. Ethyl butyrate, an ester used for orange and pineapple flavoring, can also be used to express aromas of mango in beer. “Saison is a philosophy, not a style”. Bière de Garde, a cousin to saison, should not be phenolic (exhibiting spice character). It should be clean and lager-like. Why use multiple barrels instead of a single foeder (basically a massive barrel) for aging beer? Having multiple vessels with different interpretations of the same beer allow for blending options. 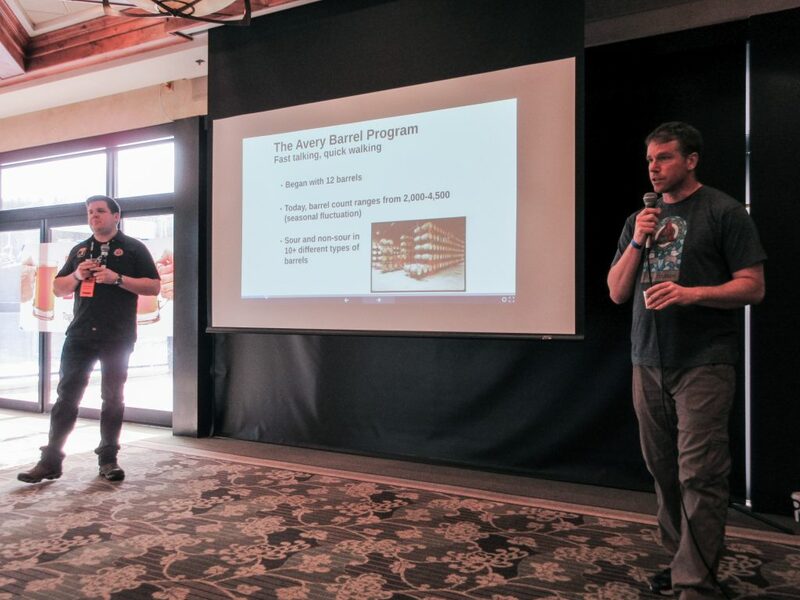 Andy Parker, Special Projects Manager & Barrel Herder, Avery Brewing Co.
Patrick Combs, Mad Sensory Scientist, Avery Brewing Co.
Consumer education increases a demand for quality. Yes! At Avery, a bad barrel (one that produces undesirable flavors/aromas) gets two chances before they discontinue its use. Their average time for barrel aging is 10-12 weeks. They use a high yeast pitching rate to get quicker results. They limit the time of barrel aging because the dry climate increases evaporation over time. To prevent a moderate loss of beer, they chose 10-12 weeks as the sweet spot. The idea of complexity vs. distraction: Do certain flavors or aromas add to the overall expression of the beer, or do they create imbalance and detract from it? Some seminars were more about sensory experience than a discussion or delivery of scientific findings, but I enjoyed them all for what they had to offer. 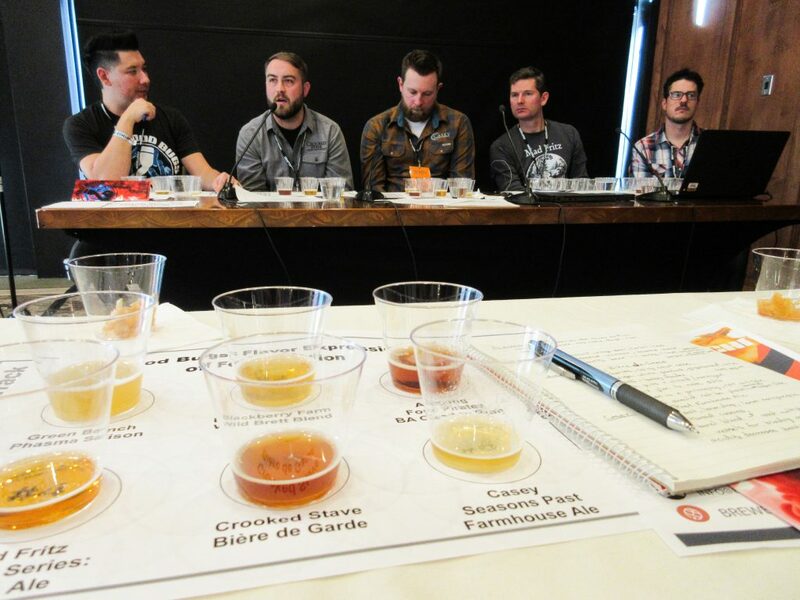 I found the Experimental Brewing seminar to be the most interesting of the lot, though I went into it thinking it would be a bunch of fluff and opinions. I was so very happily wrong. Bring a pen and a notebook, write down everything, sit in the front row, and sip on a cup of coffee if you have to. Show up early, leave late, get involved, ask questions, shake some hands and say some thank yous at the end. Keep an open mind and do some research later on. A big thank you to Big Beers for hosting an enlightening set of seminars! See you at Big Beers 2019!